The Zion Narrows is one of America's most unique and exhilarating hikes. This challenging route leads deep into a 2000' gorge carved in the Markagunt Plateau by the North Fork Virgin River. Spectacular canyon scenery, lush vegetation, emerald waters and towering slots highlight the 10-12 hours needed to complete the hike. While the Narrows hike is not technical, thorough preparation is required to maximize your time and ensure a safe, enjoyable trip. Varied terrain and long stretches of uneven river travel require athleticism, and you'll need endurance if tackling it in a single day. Note that the Park will not allow entrance to the Narrows when the river is flowing above 150 CFS. Be sure to check flows in advance and plan your trip accordingly. Follow signs from the Chamberlain's Ranch parking and shuttle drop-off area for the Narrows. Here you'll enter private ranchland; be mindful of grazing cattle and stay on the designated trail. The trail crosses a stream just past a Narrows information sign (this is not the river entry point) and turns down-valley on a 4WD road. The road-trail traces the headwater stream for nearly 3 miles before entering the river canyon. At 2.5 miles you'll pass Bulloch's Cabin, a well preserved homestead. The road-trail ends several hundred yards past the cabin and drops close to the stream on a dirt path. There are several 'routes', but all parallel and eventually lead into the stream. Take the path as far as you can, but it's increasingly evident that crossing and eventually entering the (now wider) stream will be necessary. At this point it'll also be clear that you're entering a canyon, and before long you'll be traveling almost exclusively through water. The canyon walls gradually rise, as do water levels. After 3+ miles you'll have officially entered 'The Narrows' (1.25 hour mark). From here the trail is the river and its banks until reaching the end of The River Walk Trail near the Temple of Sinawava. The next few miles are compelling but lackluster compared to what's ahead. Early stretches feature easy wading from bank-to-bank and short intervals on well-defined forested footpaths. The first exceptional stretch occurs around Maple Camp, where the walls close in and rise nearly 800'. It's an estimated 3.5 hours before reaching this area. After 4 - 4.5 hours of hiking the river plunges over a 12' waterfall; you'll circumvent this waterfall by staying left and hiking up and over a steep, narrow but well defined path. The water level near the falls can be deep, but you can make your way back up stream for a better look. Less than a mile past the falls you'll reach campsite #2 and Deep Creek (5 hour mark), where water levels and CFS increase at one of the North Fork's most significant tributaries. The next 10 campsites are spread over the next 2-3 miles. Pay close attention to campsite markers if camping, as they're easily missed amid the scenery (and travel back up stream is appreciably more difficult with heavy packs). At the 5:45 hour mark you'll pass Kolob Creek, considered by many the most interesting of all side canyons on the route. Overnighters should plan for a short side trip up this attractive slot. 1.3 miles past Kolob Creek (near campsite #10) is Goose Creek, another compelling side canyon. 45 minutes away and shortly past campsite #12 you'll reach Big Spring, an 8' cascading spring naturally filtered by the sandstone cliffs above. This memorable area is highlighted by hanging gardens, deep green waters and high walls. Anticipate deep water in the Big Spring vicinity. After Big Spring you'll enter the most dramatic - and potentially challenging - section of The Narrows. These next 2+ miles of vertical slots hold the deepest waters and offer little safe high ground. This is arguably the most dangerous section of the river with respect to flash floods, coupled with the fact that many hikers begin to fatigue by this time. If rain is imminent, consider not entering this section. It may take a good deal of time and effort to navigate this section, especially if the flow is brisk. Anticipate several lengthy swims. About 2.3 miles below Big Spring you'll pass Orderville Canyon, where the canyon yields to wider banks that support cottonwood, pine, grasses, horsetail and wildflowers. The final 2.7 miles - which pass through the canyon's most diverse terrain - require minor scrambling through large boulder fields. Fading light and fatigue may be factors on this leg. Upstream hikers signal proximity to the Narrows' end at the The River Walk Trail, at which point you'll exit the river for a leisurely stroll on level ground to the Temple of Sinawava shuttle stop. Permits are required for all North-South travel, and are limited. It's recommended that you pre-register online through the official NPS website. There is a $5 fee. Permits may also be obtained at either Visitor Center on the day before you plan to hike. Permits are not issued when the flow is 120 cubic feet per second (cfs) or greater. Over half of all available permits are available using a calendar reservation system. Reservations are available online during a three-month time frame. On the fifth day of every month at 10:00 am MST, reservations for the next month become available. If they are still available, they can be made until 5:00 pm MST on the day before your trip. If there are no advanced reservations for the one day available, the Last Minute Drawing will become an option 7 to 2 days before your trip. If spaces remain after the Last Minute Drawing, walk-in permits become available the day before your trip. Backpacking sites are available as walk-in permits and can be obtained at park visitor centers the day before your trip. Footing is often difficult and uncomfortable in the riverbed. While there are several viable options, sandals and sneakers are strongly discouraged. Neither will provide the all day support and resilience necessary on the rocky riverbed. Sturdy boots with ankle support and some water resistance are a good choice. Shoes with good traction that are specifically designed for rugged river activity are also ideal. Saloman makes such a shoe, as do other reputable outdoor gear manufacturers. Your feet are all you have - be sure to have the best footwear possible. Consult a Ranger and the numerous outfitters in Springdale for suggestions. Quick dry clothing and bathing suits are best. Cotton of any kind, which tends to stay wet and draw heat away from the body, is strongly discouraged. Additional warm clothing layers made of synthetic materials are ideal, as is a water resistant jacket. Your balance will be tested in the river - a pole of some kind will help immensely. Composite metal hiking poles are light, easy on the hand and adjustable, but also subject to damage (some hikers have reported pole bending and telescopic segment failures). Wooden hiking sticks - easily found in Springdale outfitter shops - are heavier and less comfortable, but are the most reliable. Regardless of preference, have one with you. You will get wet - have sufficient dry-bag space for all of your belongings. If camping overnight - and regardless of daytime temperatures - extra warm clothing is essential, as evening temperatures in the canyon can drop significantly. Day hikers should prepare for the cooler temperatures of the late afternoon and early evening, as well as an emergency stay over. Even conditioned and experienced hikers can push the limits of available daylight. The final 4 miles of The Narrows are nearly impossible to navigate in the dark. Have a reliable light source, extra batteries, etc. Shorter days in spring and late summer make having a good light source imperative. A standard first aid kit will help you deal with the little nicks and bruises you're likely to endure. Ace Bandages and Duct Tape are also ideal for ankles, knees and the unexpected. The trip can always take longer than expected; treatment tablets or a pump within your group will ensure that water is available at all times. The park provides an excellent timetable that can be used to pace your progress. Carrying this with your map is highly recommended, and may be invaluable when planning rest schedules and side trips. Food, camera batteries, light sources, maps, clothing etc. 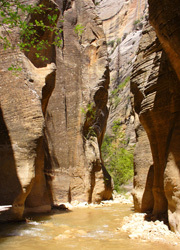 June - August, when water levels and temperatures are safest, are ideal times to hike The Narrows. However, conditions change from day to day, and are impossible to predict. Check with the Zion Canyon Visitor Center for the latest weather forecast and possible advisories. Flash floods can occur at any time, but are most common from mid-summer through early fall. Regardless of daytime temperatures, the canyon is often cooler and shadier. Also factor in that you'll be wet and, for day hikers, likely traveling in the cooler early evening hours. Trips from November through May usually require additional cold weather and water preparations that include but are not limited to wet or dry suits. Flash Floods, Hypothermia and Injury are the three biggest concerns in the canyon. Consult a Ranger for specifics on handling flash floods. Understand that even distant rains can have an appreciable effect on water levels and flow rate. Be cognizant of changing conditions and aware of distant thunder that may indicate nearby rain. Hypothermia can be avoided by taking additional wool or synthetic clothing. Cotton clothing of any kind is discouraged, as it tends to stay wet and draw heat away from the body. On a hike such as this, injuries are always possible. Good footwear and appropriate clothing will minimize the risk. Small cuts and bruises can be treated with basic first aid kits. Consider bringing wraps, ace bandages and duct tape for ankles and knees. There are 12 numbered campsites, each located above the high water mark at a different spot along the route. Because conditions are so variable, only one-night stays are allowed. Campsites are assigned on a first-come, first-served basis upon completion of a backcountry permit. Permits may be obtained at either Visitor Center, the day before the planned hike or until noon on the day the hike begins. Campsite capacity is limited, and only two sites can accommodate groups larger than six. The National Park Service has introduced a human waste disposal program for overnight users in the Narrows. An environmentally friendly human waste disposal bag, complete with use and disposal instructions, will be provided to all party members with every Narrows overnight permit. The bag is called Restop 2. It's a lightweight, sanitary way to pack out waste. The bag within a bag design and ziplock closure securely contains waste and odor, while the special blend of polymers instantly breaks down waste and turns it into a deodorized gel. The contents of the bag are safe for landfills and may be deposited in the trash. Use of this waste disposal system is strongly encouraged as a means for protecting the Virgin River. Commercial shuttle service is available to Chamberlain's Ranch, and is more practical than a two-car shuttle. There is a fee charged per person - ranging from $25 - $40, depending on the service - and seating is limited. If you have two vehicles, you can shuttle yourself by parking one vehicle at Chamberlain's Ranch and the other at the Zion Canyon Visitor Center. In either case, at the end of your hike at the Temple of Sinawava, you must catch the Zion Canyon Shuttle back to the visitor center. Should you elect to do the Narrows as a day hike, the following is provided as a guideline for your hiking progress. This is a guideline only, as everyone's abilities are different. The Virgin River is one of the Colorado Plateau's last (mostly) free flowing river systems. 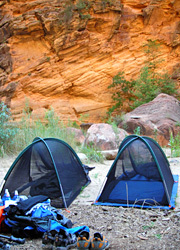 There are 12 numbered campsites located above the high water mark along the river. Because conditions are so variable, only one-night stays are allowed. Campsites are assigned on a first-come, first-served basis upon completion of a backcountry permit. Permits may be obtained at either Visitor Center, the day before the planned hike or until noon on the day the hike begins. Campsite capacity is limited, and only 2 sites can accommodate groups larger than 6. The bag is called Restop 2. It's a lightweight, sanitary way to pack out waste. The bag within a bag design and ziplock closure securely contains waste and odor, while the special blend of polymers instantly breaks down waste and turns it into a deodorized gel. The contents of the bag are safe for landfills and may be deposited in the trash. Use of this waste disposal system is strongly encouraged as a means for protecting the Virgin River. Contact the park in advance of your trip for current permit information, river flow and weather. Permits are obtained at the Visitor Center. Chamberlain's Ranch is a 1.5 hour drive from Zion Canyon, along paved and dirt roads. The dirt roads are passable for normal cars only when dry. When wet, they may be impassable even for 4-wheel-drive vehicles. Snow closes the road in winter. From the park's East Entrance station, drive 2.5 miles east on Route 9. Turn left on a paved road and continue 18 miles to a bridge that crosses the North Fork of the Virgin River. Turn left beyond the bridge and drive .25 miles to the gate of Chamberlain's Ranch. Close the gate behind you. Drive a half mile further and park just before the road crosses the river. To begin your hike, cross the river and follow the road for approximately 3 miles. Enter the river at the end of the road. Chamberlain's Ranch is a private ranch outside of Zion National Park. Please respect private property.